1. Preheat the oven to its lowest setting. Cover the potatoes with salted water in a large saucepan and simmer for 17-20 minutes, until tender. Drain well then roughly crush in a large bowl with a potato masher. Meanwhile, blanch the Brussels sprouts in boiling, salted water for 3-4 minutes. Drain and refresh under cool water. Chop roughly. 2. Put 1 tbsp oil in a large, non-stick frying pan and add the salad onions. Sauté over a gentle heat for 2 minutes, then add the nigella seeds, mustard seeds and curry powder; cook for 1 minute. Stir through the chopped sprouts and season. Add to the crushed potato with the coriander and 1 tbsp mango chutney. Mix thoroughly and, with clean hands, form into 12 well-compressed, round patties. 3. Wipe out the frying pan; set over a medium heat. Add 1½ tbsp oil and 6 patties. Cook gently, for about 4 minutes on each side, until golden. Drain on kitchen paper. Keep warm in the oven while you cook the remaining 6 patties in the remaining 1½ tbsp oil. 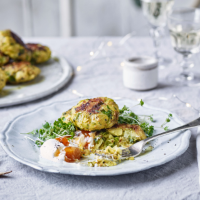 Serve with the salad cress and reserved coriander leaves, plus dollops of mango chutney and Greek yogurt. These are also excellent served with smoked fish and poached or fried eggs. This recipe was first published in Thu Nov 29 16:45:44 GMT 2018.